ENTHUSIASM – Love to teach and pass their enthusiasm on to their students. CREATIVITY – Engage students with original thinking and new ways of looking at learning. DEDICATION – Committed to inspiring the students through outstanding role modelling of commitment, character and good values. DRIVE – Comes to school every day ready to give their class the best learning experience. 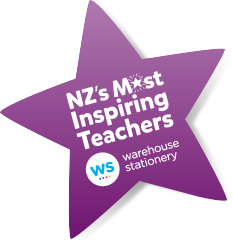 These are the qualities that the Warehouse Stationery NZ’s Most Inspiring Teacher award judges were looking for from the hundreds of nominations. 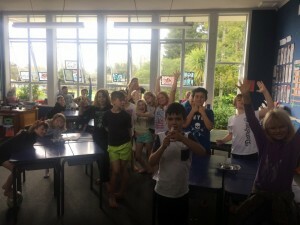 We are extremely proud to announce that our very own MISS B has been chosen as the RUNNER UP in the primary/intermediate school category for NZ’s Most Inspiring Teacher award. She has won a bundle of prizes which include an assortment of items for Maungakaramea School too! Congratulations Trudi and the parents and students that nominated her. And thanks to everyone who voted. We’d also like to say a big congratulations to James Green for being nominated and to Sophia Roulston for making the top 100. We are very lucky to have such amazing teachers and support for them!